Recommend A… is a SUPER meme hosted by Shanyn from Chick Loves Lit that lets us get a little random, and a little off the radar. I LOVE IT. Friends, when I read TIGER LILY just a few months ago, I kind of went into it a little slowly, but by the time I got to the second half, I really couldn’t stop reading. I couldn’t turn away from the heartbreaking story of Tiger Lily and Peter Pan, even though you know from the beginning where things are heading. The way Jodi Lynn Anderson wraps up her story is really beautiful. Sad and emotional, but very poetic. I was up WAY late reading the last chapter or so, and then rereading it over and over. And then I kind of was exhausted from crying and being emotionally wrung out a little bit. But yeah. I wasn’t putting this one down unfinished, friends! Specifically, her Summer series. The story of Belly and the Fischer boys is emo, broody, sweet, sad, and AWESOME. Plus it’s got the bonus of a beach town, a triangle that isn’t irritating at all, and a real sense of…reality, I guess. There are lots of things in the Summer series that ring true–not everything, but lots of things. 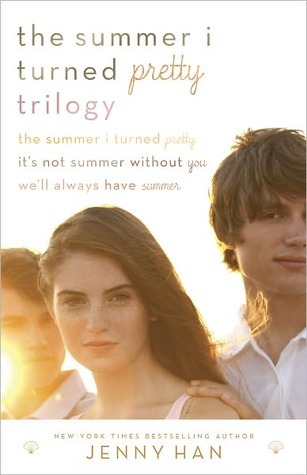 The tone of Jenny Han’s books would be perfect for fan of Morgan Matson! Ahh, summer. I love it so much when it’s just gathering steam, but I’m never sad to see it go because fall is my FAVORITE season of ever. And since we’re talking about seasons this week, I might as well just tell you up front that I’m a seasonal reader. Like, I won’t read books about summers on the beach at Christmas time, just like I won’t read books that take place in cold, snowy climes in the summer. I also often find myself craving less substantive books in the summer. Fall is basically fantasy time. Anyway, this post is really getting away from me. FOCUS, AMY. BOOK THAT REMINDS ME OF SUMMER. I’m going to hit you with some MG this week, friends. This is one of my favorite middle grade series ever, and it just so happens to take place in the summer. I first read it in the summertime, so every time I look at it or reread it, it reminds me of summer. 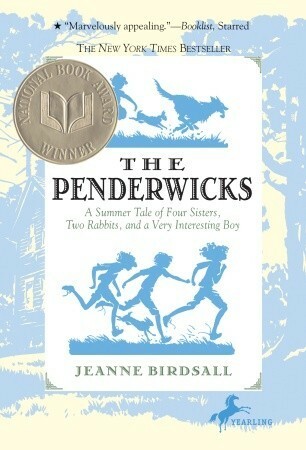 But more than taking place in the summertime, THE PENDERWICKS is a really sweet, funny, heartwarming story about a family of sisters living with their widowed father. The sisters are so different but close, and their father is lovable if a little absent-minded. SUCH a great series, guys. Friends, this book–a Peter Pan prequel/retelling from the point of view of Tiger Lily–is flat-out amazing. Seriously. I’ve always loved the Peter Pan story, but the one that we are familiar with is so different from the one Jodi Lynn Anderson tells in TIGER LILY. I called it a prequel earlier because it really does take place before the timeline of the story most people know. But that doesn’t mean it isn’t heartbreaking and beautiful and basically outstanding. Read this one. At home, on vacation, in the car, wherever. One of the things that I’ve loved about blogging almost from the instant I started my blog is the feeling of not being alone in the things I like. I can think of only a VERY small, not-quite-handful of people in my real life who read the same books I do, and like the same things I like. The people I have the most in common with sometimes are YOU all, and these three bloggers are some of people I often find myself fangirling with over lots of things. But trust me: there’s so many more, and that’s the best feeling EVER. Guys, April and I seem to always be shouting out some of the same books at the same time. Honestly, it’s a little bit cray. But if she recommends it, and I haven’t read it already, I pretty much know that I’m going to love it. Especially if it’s a fantasy or a middle grade book. I’ve bought/borrowed quite a few books on April’s recommendation and, wouldn’t you know it. I loved them. 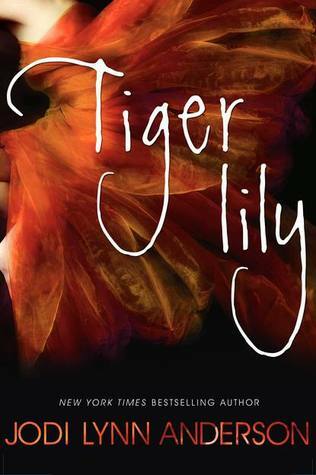 Alyssa and I just recently had some major Twitter fangirling over TIGER LILY, which I still have not been able to collect my thoughts on enough to write my review. She wasn’t a huge fan of one of my favorite series ever, Outlander, but that’s ok. Every time I check out her blog, which is awesome, I find myself nodding my head or actually talking out loud to her through my computer screen, telling her how much I am TOTALLY on the same page. HEY GIRL! Lisa is my go-to blogger for all of my nerdiness. Legend of Korra, fantasy novels, and just general geekery. But the big one is DEFINITELY Game of Thrones. Now that she’s all caught up, we can nerd about it LOTS. And trust me: If you can’t find something to nerd over when it comes to GoT, you must not have liked it very much, because there’s SO MUCH TO DISCUSS.